This book stars a guinea pig by the name of Sasspants.There. I've just told you everything you need to know to enjoy it. No need to thank me. Unfortunately, I have the creeping suspicion in the back of my medulla oblongata that there may be folks out there for whom "Sasspants"-monikered rodentia is not enough. Perhaps you are wondering what else there is to find in this bite-sized graphic novel. It's a slight little thing, after all. Coming in at a mere 48 pages you might be inclined to take it for a picture book or some such nonsense. Nonsense, I say, because this is a fantastic mystery rolled up in a small comic format. Cute as a button and occasionally laugh-out-loud funny too. Sometimes the best discoveries come in the smallest packages. And did I mention the guinea pig was named Sasspants? I did? Hm. Moving on.The place: Mr. Venezi's Pets & Stuff. The time: late afternoon. The crime: Petshop owner and general bonehead Mr. Venezi has discovered that his sandwich disappeared during lunchtime and he blames his koalas (they're actually hamsters but Mr. Venezi isn't exactly a pro at the whole identifying-the-pets-you're-selling thing). If the sandwich disappears one more time then that's it for the "koalas". So when Hamisher the hamster sees that there's a resident Guinea PI in the shop (the "G" has fallen off her sign) he decides to hire guinea pig Sasspants to solve the crime. Sasspants, for her part, would like nothing better than to be left alone, but that's not going to happen as long as Hamisher's around. They strike up a deal: Sasspants will solve the mystery and Hamisher will leave her alone. What follows is a good old-fashioned mystery, complete with red herrings, false suspects, and the occasional sandwich-shaped turtle. A nonfiction section at the end gives some additional pet and animal facts.We're looking at a first time children's book author and first time children's book artist with this book. One thing Venable does well right from the get-go is voice. You have no trouble distinguishing between your two heroes, after all. Imagine Nero Wolfe as a female guinea pig and Archie Goodwin as a hyper hamster. That's essentially the storyline we're facing here. Sasspants is a good egg but all she wants out of life is to be left alone. Hamisher, in contrast, is an upbeat social sort. All the other characters fall into place as well. From the idiotic pet shop owner to the easy-to-distract fish to the uppity bunnies, everyone is distinct. You'd never guess that this was Venable's first outing in the literary realm.I can only imagine the tension a graphic novel author must feel when they don't know what artist they'll be paired with. Stephanie Yue's a relative newcomer to the field of children's literature, but boy does she have a way with a comic panel. It's not enough to have funny writing in a book like this. The visual gags have to be spot on or you're sunk. But from the moment Yue paired Hamisher's verbal onslaught with a single wordless panel of Sasspants closing the little hamster's mouth, I was hooked. Timing is everything. Yue also has a keen sense of design going on here. Panels get broken up constantly, shifting from long shots to short boxes and back again. In spite of the small page size the images and speech balloons never look cramped. Add in tiny visual details like the twitch of Sasspants' eye when irritated or Hamisher dressed like Andy Warhol (a detail I missed until about the fourth reading) and you've the impression that this artist was paying attention to her material.Now the fact that Sasspants is female was a definite plus. Particularly since in most comics/animated movies/television shows, female animals usually sport foot-long eyelashes or little strategically placed powder pink bows. Sometimes there's even the hint of breasts. It's unpleasant. Full credit to artist Stephanie Yue for rejecting the usual ladyparts for our heroine then. Sasspants reads books, thinks about things logically, and wants to be left alone. I'll take my strong females where I can get them. Even if they are short and furry.The nonfiction section at the end called Hamisher Explains is rather delightful as well. It gives basic facts about everyday pets, then shows why Mr. Venezi is wrong when he calls finches "llamas" or chinchillas "camels". Pet loving young `uns will learn random information, like the fact that "no two finches sing the same song, but dads pass similar songs down to sons. "If I've any objections to the book I'm concerned that it's so short. It worries me that libraries might not place it in the graphic novel section because of its strange page count and format. It's smaller than a picture book, so if it ends up in picture book sections it'll get lost. It's also thin, so if it's placed on graphic novel shelves it may be too skinny to draw the eye. So I guess I'm just going to pin my hopes on the chance that this book and the ones that follow it will sell well and then, someday, they'll be compiled into a delightful compendium volume with enough pages not to scare off the kids who feel they're too old to be reading 48 page books. As it stands, I'll be talking this book up left and right with my young readers. It's funny, smart, and full of slam-bang visuals. For graphic novel enthusiasts who are into mysteries, pet shop politics may not be their first pick. It'll be exactly what they're looking for if they're smart enough to pick it up, though. A hoot.Ages 4-10. This is a humorous mystery in a pet shop where the guinea pig has to figure out who is eating Mr. Venezi's sandwich every day. The illustrations are colorful and cartoonish and the narrative is entertaining, but sometimes a bit disjointed. I had to reread several pages because the story wasn't really making sense. I think a large part of it is the fact that Mr. Venezi is very nearsighted and labeled his pets as another completely unrelated animal. We enjoyed reading this book together - the animals are adorable. I usually refuse to read graphic novels aloud, but this book is more of a hybrid between a graphic novel and a picture book, so it wasn't too difficult. Booklist (March 15, 2010 (Vol. 106, No. 14))Grades 1-3. Who is stealing Mr. Venezi’s sandwiches? The befuddled pet-shop owner misidentifies the store’s animals, leading the hamsters to think they’re koalas. In this first book in the Guinea PIG, Pet Shop Private Eye graphic-novel series, Hamisher the koala-hamster thinks Sasspants the guinea pig is a private investigator because the second G on her cage’s sign has fallen off, so he asks her to investigate. They travel through the pet shop, questioning the various animal suspects (rabbits, a snake, a parrot), and Sasspants decides to set a trap for the thief by disguising the shop’s turtle as a sandwich. Grumpy Sasspants, hyper Hamisher, creepy Gerry the snake, the goldfish (whom Mr. Venezi calls kangaroos), and the other animals all have distinctive personalities. Young readers will appreciate the zaniness of the pet shop and the fun mystery, and Yue’s colorful art uses a straightforward panel design that’s easy to follow. The book includes fun facts about snakes and other animals Mr. Venezi thinks he has.Horn Book (Fall 2010)Someone is stealing pet-shop owner Mr. Venezi's sandwiches every day. A wrongly accused hamster (who thinks he's a koala) begs the store's resident surly private-eye guinea pig to help clear his species' name. Most of the ill-tempered humor in this hard to follow comics-style book falls flat. Information about a random selection of animals is appended.Kirkus Reviews (March 15, 2010)There is skullduggery afoot at Mr. Venezi's Pets & Stuff: Someone keeps stealing his sandwich, which he puts outside the koala cage every day. No, he doesn't sell koalas; they're really hamsters, but Mr. Venezi is both shortsighted and incompetent (though very kind). The only cage that's correctly labeled is the one holding the guinea pig--but someone has stolen the G, so little Hamisher the koala, er, hamster has decided that guinea pig Sasspants must be a P.I. and therefore can crack the case. Venable's series opener just gets loonier. The irascible Sasspants would rather be reading, but, seeing that Hamisher won't leave her alone, she swings into action. The actual mystery plays second fiddle to the over-the-top characterizations and snappy dialogue: The goldfish are thoroughly brainless, Gerry the corn snake is inscrutable, the chinchillas are prima donnas (one of them has a pet white mouse). Yue's graphic panels, colored by Hi-Fi Design, make the most of the comic potential and extend it with plenty of visual slapstick. Middle graders will close this and ask right away for Detective Pants's next caper. (animal facts) (Graphic mystery. 8-12)Library Media Connection (October 2010)This graphic novel series stars Sasspants, a private detective guinea pig. The illustrations are realistically done, but the classic comic page setup might prove difficult for some readers. In this first installment, Sasspants and his sidekick, Hamisher the hamster, set out to find out who is stealing sandwiches from the pet shop owner. Clever readers will figure out that the owner isn?t very intelligent. He doesn?t know one animal from the next, proven by the silly labels he places on them. At the end of the book Hamisher explains how to tell the difference between those that appear in the book and those that did not. Additional Selection. Beth Green, School Library Media Specialist, Wappingers Junior High School, Wappingers Falls, New YorkSchool Library Journal (May 1, 2010)Gr 2-4-Children will love Sasspants, a guinea pig who reads in her pet-shop cage using a thimble recycled as a reading lamp. She is the only animal properly identified because she's made her own sign using tiles. When the "G" at the end of "PIG" falls off, Hamisher the hamster mistakes Sasspants for a private investigator ("PI"), and enlists her help to find who's stealing Mr. Venezi's sandwiches. So begins this humorous mystery. Children who are just beginning to read graphic novels independently will enjoy solving the case with Sasspants. The full-color cartoons enhance the comic appeal. Two funny informational pages about the pet store denizens follow the story.-Marilyn Ackerman, Brooklyn Public Library, NY Copyright 2010 Reed Business Information. Sasspants the guinea pig lives in a pet shop with a bunch of other animals. The owner of the shop, Mr. Venezi, has really bad eyesight, though, and doesn’t know much about the animals he’s selling. As a result, most of their cages are grossly mislabeled – the hamsters are “koalas,” the gecko is a “moose,” the chinchillas are “camels,” and the mice are “walruses.” Sasspants loves to read, and just as she’s about to get to the end of her book, she’s interrupted by a Hamster/Koala who thinks she’s a private investigator (somehow the ‘G’ in ‘guinea pi…’ has fallen off her cage), and wants her to help. Mr. Venezi’s lunch (a provolone, tomato, and lettuce sandwich) has been stolen every day, and he’s been leaving it right outside the hamster cage, so he blames them. The hammies want to clear their good names – they can’t even stay awake during the day, so there’s no way they’re the sandwich thieves – and Detective Pants is the only one who can help them!This is a truly hysterical kids’ comic (adults will also be rotfl); there’s a lot of subtle humor and inside jokes that adults will appreciate, too. The pets are all incredibly cute (especially the hamsters with their big, pleading eyes), and the artwork really embodies the spirit and character of the animals it depicts. Readers will be able to follow along with Detective Pants’ investigation – finding clues in the pictures that will help them solve the mystery of the missing sandwich. Sasspants and her faithful Hamster associate, Hamisher, finally put everything together in a very satisfying conclusion. This is a very silly book, and very silly people will enjoy it immensely. I shall eagerly await the next installment! Hamster and Cheese is a book about the life of the little animals at the pet store! Such a cute book. I love how entertaining it is. It is quite funny as well. The illustrations are bright and draw your attention to each animal. The man at the pet store does not identify animals well at all, which is pretty funny! Graphic Novel. This is a great graphic novel for everyone. Great detailed illustrations, very colourful and entertaining to hold people's attention all while trying to solve a mystery. Plus the guinea pigs name is Sasspants who just wants to read. I think this would be good for reluctant readers or anyone who loves animals. 1. No awards 2. Appropriate grade level - kindergarten-2nd grade 3. Summary - This is a funny story about a pet shop whose new owner mixes up all the different types of animals. As they discover who they really are, a hamster and a guinea pig team up to see who the sandwich thief is! Can the animals solve the mystery of the missing sandwiches? 4. Review - I like this book because the animals have funny reactions, and if I found it to be amusing, then I would think that young children would too. Some of the speech bubbles are a bit long but the pictures really help to get the point across. They show a lot of expression and emotion. 5. 2-3 in class uses - A teacher could use this to talk about characteristics of animals. At one point in the book, the hamster said that he never gets to see who is stealing the sandwiches because he can’t stay awake during the day. New terms such as nocturnal can be taught. This book would also be perfect for social/emotional behaviors as the pictures are so detailed. It would be easy for children to see how the various animals are feeling, and help them to describe what they see. 1. Seven to ten year old's.2. "Hamster and Cheese" is a funny and silly graphic novel that appeals to the young reader. The illustrations within the novel correctly depict the characters they portray, many of them with big eyes. The Guinea pig is on a quest to find out who is eating the pet shop owner, Mr. Venezi's sandwich everyday. 3.Within the story there are mystery elements that the children may look to the illustrations in efforts to solve the mystery which makes reading this book fun engaging and enjoyable. Personally, I love how the names of the characters are very witty for example Sasspants the Guinea pig and Hamisher the hamster. Many young readers struggle with advancing to graphic novels, so I personally enjoy the fun elements presented throughout the story in the text and the illustrations. 4. this book can be used to show young readers the fun in reading through its comedic writing. It also can inspire children to show their creativity through illustrations and text allowing them to express their individuality. Readers will delve into the fast paced lives of Sasspants and Hamisher, a guinea pig and a hamster living in a pet shop, as they work to solve mysteries. This Private Investigator (P.I.) and her sidekick come to life in this graphic novel, as this crime fighting duo work to discover who the culprit behind Mr. Venezi's missing sandwiches is. Readers of all ages will appreciate the humor and graphics which make this P.I. and her sidekick a go-to read. Great novel for those just starting to read novels. The illustration will catch your eyes and have you wanting to read the lines to make connections with the pictures. Trying to solve the case of the missing sandwiches they travel through the pet shop investigating several pets. I commend both the story line with the humor and the graphics in the novel. I have added this to my school library and I know my students will enjoy it. Sasspants, a guinea pig, is hired as a private investigator to solve the case of the disappearing sandwich. He works with Hamisher, the hamster, to sort through all the suspects and their incorrect names. As they work to solve the mystery, the graphic novel provides the reader with a chance to sort out the clues given by the spacey fish. Animals with a mystery to solve in a pet shop. The graphic novel format has lots of text to read and action going, take time to enjoy. Sasspants the guinea pig lives in a pet shop with a bunch of other animals. The owner of the shop, Mr. Venezi, has really bad eyesight, though, and doesn’t know much about the animals he’s selling. As a result, most of their cages are terribly mislabeled such as the hamsters are “koalas,” the chinchillas are “camels,” and the mice are “walruses.” Sasspants loves to read, and just as she’s about to get to the end of her book, she’s interrupted by a Hamster/Koala who thinks she’s a private investigator and wants her to help. Mr. Venezi’s has been stolen every day, and he’s been leaving it right outside the hamster cage, so he blames them. The hamsters want to clear their names because it’s not them doing it and Detective Pants is the only one who can help them so this graphic novel goes through their adventure trying to solve the mystery. Graphic novels were always one of my favorite as a kid because of the illustrations. This story is set up like any type would, in a comic book type fashion. This book uses bright colors through out the story which makes it very lively and keeps your attention through the funny drawings. With a story like this, you could almost just follow the story by only looking at the pictures. I enjoy the method of the story being told dialogue of the animals so its almost like watching a movie on pages. Title (italicize): Hamster and CheeseAuthor: Colleen A.F. VenableIllustrator (if separate from author): Stephanie YueGenre: Graphic NovelTheme(s): Animals, Humor, MysteryOpening line/sentence: Get out of my cage! Ugh do you ever take a bath?Brief Book Summary: Sasspants who is the main character, a guinea pig is essentially a spy. He agrees to help his friend the hamster in order to discover who has been stealing sandwiches from the pet shop owner. Professional Recommendation/Review #1 (cut & paste): Kirkus ReviewsThere is skullduggery afoot at Mr. Venezi’s Pets & Stuff: Someone keeps stealing his sandwich, which he puts outside the koala cage every day. No, he doesn’t sell koalas; they’re really hamsters, but Mr. Venezi is both shortsighted and incompetent (though very kind). The only cage that’s correctly labeled is the one holding the guinea pig—but someone has stolen the G, so little Hamisher the koala, er, hamster has decided that guinea pig Sasspants must be a P.I. and therefore can crack the case. Venable’s series opener just gets loonier. The irascible Sasspants would rather be reading, but, seeing that Hamisher won’t leave her alone, she swings into action. The actual mystery plays second fiddle to the over-the-top characterizations and snappy dialogue: The goldfish are thoroughly brainless, Gerry the corn snake is inscrutable, the chinchillas are prima donnas (one of them has a pet white mouse). Yue’s graphic panels, colored by Hi-Fi Design, make the most of the comic potential and extend it with plenty of visual slapstick. (animal facts) (Graphic mystery. 8-12)Professional Recommendation/Review #2: Looking Glass ReviewThere is a mystery in "Mr. Venezi’s Pets and Stuff" shop. Someone is stealing the provolone sandwiches that Mr. Venezi brings to work every day, and he thinks that the hamsters are to blame. If the real thief is not found, and soon, Mr. Venezi is going to send all the hamsters away.Desperate to save himself and his cage mates, one of the hamsters goes to the guinea pig cage. The letter G has fallen off the label on the cage so the hamster has come to consult with the “GUINEA PI.” Though the resident guinea pig, Sasspants, insists that he is not a P.I. (a private investigator), the hamster refuses to take no for an answer. The only way Sasspants is going to be able to get rid of the annoying hamster is if he solves the mystery himself.This is a very amusing first title in what promises to be a wonderfully engaging series. Children who prefer stories that are rich in graphics will be delighted by the comic strip style format in the bookResponse to Two Professional Reviews: This story essentially consists of graphic novel writing to its entirety. There is a clear story to it however I agree that if children are very into graphic novels this would be a perfect story for them. As each review stated it is full of illustrations popping out and intriguing for young children interested in these types of stories. Evaluation of Literary Elements: Consideration of Instructional Application: I feel as though graphic novels brings up a very different and unique topic to talk about in class regarding reading and writing. I would have my students put together both of their reading and writing skills to create a comic strip of their own that describes their favorite hobbies. This would allow them to use their creative writing skills as well as their knowledge to create a story that is presented in a different way. 1) This book was rated suitable for grades 1-4. The text balloons were easy to follow (left to right, and also some connected to one another in a circular format). The illustrations were delightful, colorful and often full of details. If you looked at the illustrations carefully, you would see a "lump" in the snake's belly or pick up that "guinea pig" in later frames was missing the "g" as Sasspants (the guinea pig) was actually a private investigator. 2.) The type of reader I would suggest this book to would be a lover of animals and animal antics. Readers of this book should be familiar with basic animals in a pet shop or confusion would easily set in if they were not (see #3). The last two pages of the book attempt to correct this mislabeling but do not achieve that. I would rate this graphic novel as grade 3+ specifically for these inaccuracies which for an older student could be seen as humor. Even in fantasy books, we all hope to learn something by reading and these playful descriptions do nothing in that regard but to pose questions in my mind as to why the author had to write this way in the first place.3.) The one aspect of this book that must be brought to teacher's attention is the inaccuracies (playful as you will or students may find) of the animals in the fictional pet shop. Aside from the Guinea Pig, there is not one animal's cage that has the proper label on it. For example the snake is labeled as a llama, parrot is labelled marmot, etc. The animals even say the shop owner doesn't know his animals very well and the animals know what they are, but as a young child reading this book, I would expect they to be confused. Third or fourth graders who are familiar with zoo animals or have studied animals in class, would probably pick up on the humor however. The last two pages do address this issue: "Animals NOT appearing in this book and how to tell the difference" but it is still unclear as to why the author felt he needed to include these odd references. Silly descriptions find their way in these "clarifying" paragraphs too. On the other hand, there are some fascinating facts about snakes to be found at the end, too. Reason for Reading: Both books 1 & 2 are Cybils '10 nominees and as a panelist for Graphic Novels they are required reading for me.This is absolutely adorable! The artwork is so cute and the animals have such personalities it was a joy to read. Elementaries are going to love this series. Sasspants PI inadvertently gets mistaken for a detective and the hamsters call on him to solve the case of the missing sandwiches. Every day the owner puts a sandwich near the hamster cage for his lunch and every day it disappears. He has said if it happens one more time he is going to get rid of them once and for all. Only the hamsters don't know what is happening as they can't stay awake and Sasspants takes the case to get the annoying hamster off his back. The owner is somewhat addlepated, having labeled the animal cages with all the wrong names: the hamsters are koalas, the mice are walruses, the chinchillas are camels and so on. But what really makes this so entertaining are the personalities of the animals. Sasspants is a reader who wants to be left alone, a take charge guy just to get everyone off his case. The goldfish are my favourite with their short term memories, they can hardly remember each others names long enough let alone have an intelligent conversation. Then the hamsters who spend most of their time sleeping except the one who has befriended Detective Pants and thinks they have become best buddies, though he does have a tendency to fall asleep frequently and also believes he may still be a koala like the sign says. The last pages include an article on a non-fiction topic relevant to the story, this time explaining how a snake can eat something four times the size of its mouth and a last page telling the differences between what the owner labeled the animals and what they really are. Adorable! A review of Hamster and Cheese by Rachel LangenfeldI will introduce my students to the book by asking how many students have been to a pet shop and what kinds of animals they may find there (Text-To-World Strategy). Do you find zebras, koalas or moose at a pet shop? What about rabbits, fish and hamsters?I will get my students excited about the book by telling them they can help solve a mystery, the mystery of a stolen sandwich. They get to be Private Eye Detectives and help the animals in the pet shop find out what happens to it. Have you ever lost anything that you really like and wanted to find it? How did you start looking for it? Did you ask your friends and family if they saw it? Did you retrace your steps to try and remember what happened? Detective Sasspants, PI decides to do just this. He asks all the animals around him if they saw what happened and to describe who took the sandwich (Text-To-Self Strategy). A television show my students will probably know is “Dora the Explorer”. Dora is always looking for something and it takes her different steps to get there. She has to ask people to help her on the way there and she needs to use her thinking and problem solving skills to find what she is looking for in the end. I could show my students a clip of the show to remind them of her experiences and struggles (Text-To-Text Strategy).An activity I could do with this book is to hide an object in my classroom and write clues to find it on note cards that are taped around the room. It would be like a scavenger hunt where students would have to use their critical thinking skills to understand what the clue means. I would put a couple of red herring clues in there to see if it throws them off. I thought this graphic novel was a great book for elementary school kids. It is a fun mystery-solving story with cute pet store animals such as hamsters, guinea pigs, birds, fish, snakes, and rabbits. An elementary school student would be able to relate this story to his own experiences if he or she had one of these animals as a pet or if he or she has ever had to solve a mystery of any kind on their own. For example, if one of their toys went missing one day and they had their own investigation to find it they could relate that experience to what Sassypants the Guinea Pig did in this story to find out who was stealing the sandwich. A student could relate this story to another text with the TV show, "The Wonder Pets." This show is an early childhood program about three classroom pets, a guinea pig, a turtle, and a duck, who go around the world to help animals in need. Every episode the guinea pig, who is the leader of the Wonder Pets, has to problem solve and brainstorm to find out the best solution just like how Sassypants has to problem solve and think to solve the mystery of the stolen sandwich. A student could have watched this show while he or she was growing up or could still watch it and be able to relate this book with that show. A student could relate this story to the world by using the techniques that Sassypants uses to solve mysteries that come up in their daily life. By reading and seeing how Sassypants approaches the problem, the child could use these techniques practically in day to day situations that come up. Hamisher the Hamster (who thinks he's a koala) needs help! Mr. Venezi the pet shop owner has been losing his sandwiches, and if he continues to suspect the hamsters, he may just get rid of all of them. When Hamisher mistakes Sasspants the Guinea Pig for a private eye, he thinks all his problems are solved. Sasspants, who is not really a detective, decides to help Hamisher so that he'll leave her alone to read her book. But who could be stealing the sandwiches? One of the other pets? Or a visitor to the pet shop? Following clues and interviewing suspects is difficult when you're surrounded by such silly pets and humans, but Sasspants is determined to solve the case.This book kind of gave me a headache. I'm sure kids will find it funny, but I found the humor pretty flat and a bit confusing. It doesn't really make sense that Mr. Venezi incorrectly identifies all the animals, and it's never explained why (view spoiler)[the mail carrier would steal his sandwich (hide spoiler)]. I gave it two stars because I'm sure there are kids who would enjoy it, but I think there are much better options out there for funny books.I would recommend this to grades 2-4 for kids who are just starting to read longer books on their own or just getting into graphic novels. Obviously it will appeal to animal lovers and those wanting a funny book. Readalikes might include the Squish series of graphic novels or the series Joey Fly Private Eye. 1. Graphic Novel2. A hamster and a guinea pig try to solve a mystery for their pet store owner. He wants to know who is stealing his sandwiches, otherwise he is going to get rid of the pets.3. A- This is a fun read for students or children interested in comic books. The format is designed exactly like a comic book would be. B- I did not find anything terrible about this book, but I also didn’t find anything great. I think it is good for students who want to read, but might be on a lower reading level. I also think the message of friendship and working together was a positive theme throughout the book. Most of the book was appropriate. The animals pick on the “new guy”, the hamster, which may seem inappropriate at some points. The hamster maintains a positive outlook throughout the entire story, and I found that to be one of the strong points.C- One example, that proves my previous statements, comes from the very end of the book. The hamster is happy about solving the mystery, and the guinea pig is happy that he does not have to spend anymore time with the hamster. The guinea pig says “It’s not like were friends or anything” and the hamster replies “No, were not friends” and then under his breath he whispers “Were best friends.”4. This book could be used in a classroom for reading lessons, or on the bookshelf as a free read option. Students can also use it during a writing lesson, if they use a comic book format. Text to Self: I loved this book. I'm a huge mystery fan, and seeing the story unfold was fun. I really liked that the culprit behind the stolen sandwich wasn't an obvious choice. I always try to figure out the endings of book, especially those with twists, and I couldn't figure out who the real culprit was. I really liked that, although this is a children's graphic novel, it has appeal for adults too.Text to Text: Although it wasn't originally a book, Hamster and Cheese made me instantly think of Veronica Mars. Both Veronica and Sassypants kind of fell into being private investigators and they both worked to solve cases for their friends. I think it's interesting to see the similarities between a mystery book for kids, and a mystery book for adults. They both operate on the same general premise.Text to World: This title made me think of all the times that I've been to the pet store in my life. It made me think about how the animals interact with each other, and interact with the humans coming into the shop. It also made me think a little bit about the movie series Toy Story, when the entire shop begins to interact after everyone goes home for the night. I never really thought much about how animals, even pets, interact with each other before reading this book. This story is about a hamster trying to solve the mystery of a missing sandwich that belongs to the pet shop owner. The animals work together to figure out who the sandwich thief is. Although in the beginning of the story we think it may be one of the animals, at the end of the story we find a huge plot twist!Text to self- Growing up with three siblings there have been times when something occurs in the home and our parents give us one last chance to figure out who did it and to then fess up. In the story the animals work together to solve the mystery of who did it, just like when I was younger. I always enjoyed investigating and coming up with a conclusion that included the guilty party.Text to text- I watch a lot of Law and Order: SVU. The nice thing about this TV series is that they also have books. When reading and watching I, like the animals, find clues and try to put them together to figure out who the guilty one is. There are also books for younger kids where they are playing the detective, for example the Goosebumps books lets the reader choose where they want to within the mystery. Text to world- Everyday there are detectives that are trying to solve crimes. They gather clues and try to figure out who the guilty party is. Text to Self: I think this book relates to myself because I love animals and always loved going to the pet shop and that's where this graphic novel takes place! This story is about a hamster who becomes a private investigator, which I think we all wanted to be at one point, and solves the mystery of who ate the sandwich. I think after spy kids and all the cool movies like that came out growing up, that I always wanted to do something like that and I did for four years while I was in the military. Text to Text: Immediately when I think of detective type books I think of Nancy Drew diaries. I used to love reading them when I was in elementary and even middle school and they were always available to us for our sustained silent reading program so I tended to always pick them for their awesome mysteries. Text to world: I think this relates to the world because there are plenty of private investigators out there in the world, who do what the hamster does everyday, but obviously to a higher extent. We know of private investigators and the CIA AND FBI but its the super secret spy's we don't know about that I always wonder about! 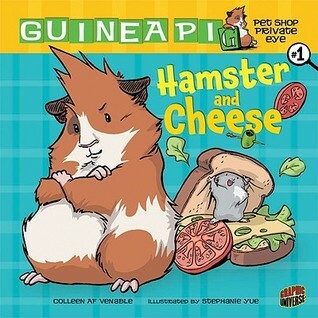 Guinea Pig Pet Shop Private Eye: Hamster and Cheese by Colleen Af Venable was one of the cutest graphic novels I have ever read. The illustrations were colorful and lively which really captured my attention. The use of space was incredible because even though each panel was a different size, they all fit together like puzzle pieces to create full page spreads. The story took place in a pet store which, in my opinion, could really attract young kids because who doesn’t love going to the pet store when they are little? Furthermore, the characterization of the pet store animals made this story easily relatable and amusing. The only negative comment I have on the overall style of the story was that in some blurbs there was a lot of text which made it somewhat hard to follow. Venable’s writing was well-organized which made the plot unfold quite nicely. There was a nice use of suspense as the guinea pig gathered evidence and declared suspects. However, my favorite aspect of the book was Venable’s humorous tone. Although catching the sandwich stealer was serious business for these animals, there was such a light humor about it which made the story enjoyable. Truly a great read! There’s something mysterious going on in Mr. Venezi’s pet store. His sandwiches keep disappearing and no one is quite sure who the culprit is. Hamisher the hamster asks Sasspants the guinea pig to help investigate the case, mistaking her for a Guinea P.I. after her letter G falls off her cage. Sasspants finally agrees after much reluctance. The story then follows this duo as they make their rounds around the pet store, interrogating the other animals. The illustrations by Stephanie Yue steal the show in this book. The animals are incredibly cute and expressive. This is a story you pick up and don’t put down until you’re finished (which is easy considering there are only 48 pages). It’s written with a sort of zaniness that kids would enjoy. The end of this book includes a “Hamster Explains…” section which is more silly that accurate. This is just a fun wacky book that will definitely make you giggle. Test to Self: I grew up reading comic books or at least looking at them, as I got older I did read Encyclopedia Brown. This kind of reminds me of reading those, although I was in 5th grade when I read them, this book would be for younger students, maybe 2nd or 3rd grade. There is a mystery to solve and our hero is a Guinea Pig, two things that kids love.Text to Text: I am finding this one hard, not sure what I could compare this book too, I can compare the characters to Shrek and Donkey. Shrek doesn't want donkey around and he helps him out with a problem. In this story Guinea Pig doesn't want Hamster around but he does help him out with a problem, in the end they help each other.Text to World: This book tells us never to jump to conclusions,always search out all the facts before you falsely accuse someone. Everyone assumed that it was the snake that was stealing the sandwich,but we find out in the end that it was not one of the animals but someone all together different. Colleen AF Venable Stephanie Yue - You might know me from such films as "Colleen's Fourth Birthday Party" and "Colleen Falls Down Over and Over Again While Ice Skating." I've had a rock stuck in my knee since 1986. I eat cereal for almost every meal.I have a huge connect-the-dots tattoo. I am often holding graphic novels, watching Phyllis Diller films, and covered in ink.I am a proud supporter and co-creator of Lumberjack Day. (every Sept. 26) lumberjackdaydotcomwastaken or I guess lumberjackday works as well. It was later turned into National Pancake Day and is celebrated a crazy amount by strangers who I want to hug. All of them. nationalpancakeday I grew up in the trees of Walden, New York….well, not very high up the trees, since I always got scared, but I did carve my name in a lot of low hanging boughs. I had an older sister, a dog, a cat, a million fish, and an imaginary pet hamster named, yup you guessed it, Hamisher. Why have an imaginary friend when you can have an imaginary friend that can fit in your pocket! I went to Wagner College and double majored in English and Studio Art, winning the award of “biggest dork” (aka first in my class) and writing plays which went on to be produced Off-Off-Broadway. My whole life I always loved reading comics—Calvin and Hobbes, The Far Side, and I wore out my copy of the Muppets: Short, Green and Handsome—but it wasn’t until I started to get into webcomics that I also fell in love with the idea of writing comics. Now I write graphic novels about a not-so-imaginary-anymore hyperactive hamster named Hamisher. The world is a very lovely place.During the day I work as the designer for :01 FIRST SECOND BOOKS, the best graphic novel publisher in the world. I love it more than I love having feet and I really do love having feet. They keep my shoes on. Pssst My name is actually spelled Colleen AF Venable. No puncutation. /Goodreads keeps telling me that is now how my name is spelled. But it is my name, so I actually know it pretty well.